At the Quaker memorial meeting for John ‘Peter’ Leyland at Bainbridge on June 22, 2010, there was very little silence as so many wanted to share their happy and very special memories of him. “This is a celebration of his life and everyone is encouraged to share their memories about Peter. 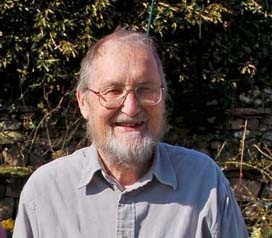 I feel extremely blessed and privileged to have known him,” said Quaker elder, Judith Bromley. When he was born in Bainbridge in January 1920 his parents dutifully gave him the family name of John but then always called him Peter. He was proud of the fact that all his grandparents were from mid Wensleydale but, after he was articled as an accountant to a London firm when he was 16-years-old he did not return to live in the dale until he retired as finance director of the Scott Bader Commonwealth in 1982. Another friend had written: “He was one of those exceptional people on earth who sought always to do the best for others and to create peace where there was lack of harmony. He was a man who stood by his principles and his deep Christian faith shone through him.” At the memorial meeting one said that Peter had shown how being guided by the Spirit did produce love, joy, peace, patience, kindness, goodness, faithfulness, humility and self control (Gal:5.22-23). Janet commented: “He was a quiet man but he was a wonderful character. And he was fun.” They married in 1982 and became very involved in the local and Quaker communities as well as restoring what had been his mother’s family home in Askrigg. Later they were able to buy back the house his wife had had built in Bainbridge. For many years he was treasurer of the Askrigg Foundation, Askrigg Millennium Fund, Friends of the Dales Countryside Museum, the Bainbridge (Quaker) Meeting, and Bainside Arts as well as of the Laurie Baker Society and Ackworth School. He attended Ackworth School from the age of 10 to 16. Peter was one of the first to buy shares in the River Bain Hydro project this year investing the £1,415 that his mother had received as compensation from the National Grid in 1953 when it took over Bainbridge’s electricity company that his grandfather had co-founded. At the annual meeting of the Friends of the Dales Countryside Museum in October 2007 Peter told the remarkable story of his family’s involvement in providing a shop and the electricity supply for Bainbridge until the mid 20th century. He explained how his great great grandfather, Alexander Tiplady, had returned from the battle of Waterloo and opened the first shop in Bainbridge. Alexander’s grand daughter married John Leyland who gave up being a travelling salesman and joined her in running the family business. It was he who with Richard Cockbone in 1912 set up Bainbridge Electric Lighting Company based on a water mill on the River Bain. The turbines were installed by William Handley Burton of Askrigg. 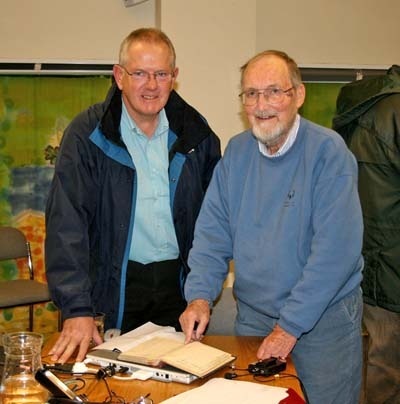 His great grandson, William Burton of Maxwells Electrical in Northallerton, was invited to the annual meeting and enjoyed discussing the various historical documents with Peter. (Right: Peter on right with William Burton.) During his talk Peter described how his mother had carried on with the shop and running the electricity supply in Bainbridge, Wensleydale, even after her husband died in 1942. At that time John ‘Peter’ Leyland was still in China with the Friends Ambulance Unit. As a Quaker he had chosen to serve others that way rather than be conscripted into the armed forces during the Second World War. See also Memories of war time China.